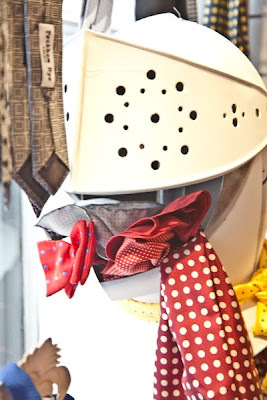 Martin Brighty and David Walker have been around the tie industry for a long time. They first met at legendary English tie-maker Holliday & Brown 20 years ago, brought in to replace the sales director and admin director at the time. Indeed the famous ‘Buster’ Brown first taught Martin how to make ties. But a few years after they joined, Holliday & Brown was bought by Michelson’s. And four years after that, both were made redundant (this was the early nineties). That spurred them to start the brand Hunter’s, which has been quietly making handmade English ties for most of the high-end fashion labels, Savile Row tailors and Jermyn Street shirtmakers ever since. 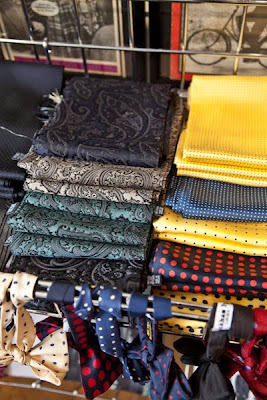 It’s probably fair to say they are one of the two last bastions of traditional English tie-making – the other being Drake’s. Many of Holliday & Brown’s customers followed Martin and David, but “you never know whether the people that said they would buy from you actually will. And even if they do, you don’t know if they will the second season,” remembers David. The US had been a big client of Holliday & Brown, so the two of them flew over to drum up support early on ­– having put together a collection of blankets with the help of Vanners – and used the resulting orders to get a bank loan. Production was done by around a dozen hand tie-makers that they knew in the UK, some of whom also worked for Holliday. “And a few of those girls are still alive today and making for us,” says David. There aren’t many of these at-home tie makers any more. Drake’s has its own factory. 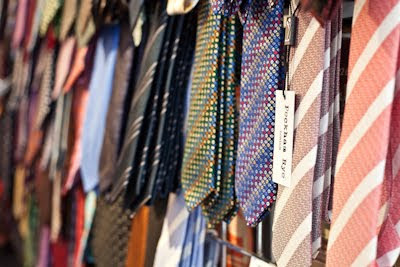 But traditionally ties were made by outworkers that had several clients and got paid per item. Weaving, equally, used to be a cottage industry until it was centralised by factories like Vanners. Martin and David had a small crisis three years ago when the one woman that made all their silk scarves retired. She had several people working for her, usually for three or four months of the year (scarf-making being seasonal work). But the workers got tired of the seasonality and either went to work in Tesco or returned home to Italy. Eventually they found a girl and her family in Oldham, who now make all the scarves. The tough thing with silk scarves is the fringing – holding many different coloured threads, bunching them together and knotting them effectively. Some that Martin and David trialled previously either used the wrong fringing thread or made knots that gradually loosened. She used to work for a hand-roll hemmer (hand rolling handkerchiefs, headscarves etc.) and took over that small business when he retired. So it all gets passed on, in bits and pieces. Until someone goes to work in Tesco. The other half of David and Martin’s operation, of course, is Peckham Rye. Now well-known for its skinny ties and silk scarves, the brand was so successful in wholesale that customers kept asking where the Peckham Rye shop was. Initially they were in Harley Street, then Covent Garden, and now in Newburgh Street (just off Carnaby St) since July last year. It finally feels like a space that suits them – cosy, quirky and decorated with Private Eye covers. As hopefully these pictures demonstrate. You can follow the discussion on The history of Hunter’s and Peckham Rye by entering your email address in the box below. You will then receive an email every time a new comment is added. These will also contain a link to a page where you can stop the alerts, and remove all of your related data from the site. Great post- I’ve finally found a shop in London which has a great variety of Paisley scarves. Can you recommend any other? Do Hunter’s have a website? If anyones interested my wife makes silk scarves based on what material she finds in Italy. Many of the traditional shirtmakers and general retailers on Jermyn St stock them, though I think Peckham Rye is probably better value. They have more options - generally a greater number of frames available, on site at least.